Scania 94G 260 Angloco Bronto F32 MDT Aerial Ladder Platform on the run at Bridgetown fire station. 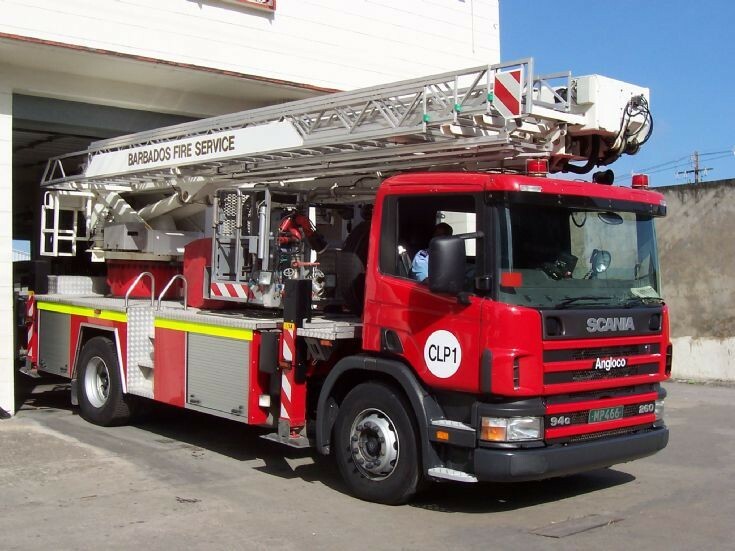 I was talking to a merchanic from Angloco recently and he was telling me that Barbados Fire Service have been buying from them for years, and Angloco send out staff from there Batley, West Yorkshire base every year to carry out servicing of these appliances. He also told me not a holiday and they have to put in lots hours to get all the work completed in the allocated time they are out there. Added by Paul Warnock on 04 January 2010. Yes Paul, I've had the same story from Angloco engineers saying its hard graft and that they also don't have a full range of tools/parts with them as they haven't taken their vans and toolboxes so if there's an unexpected fault a spare part has to be sent out to them ! Added by Rick Loudon on 05 January 2010.